CLICK HERE TO READ MORE THAN EIGHT CHAPTERS OF END STORM FOR FREE! End Storm is a horror novel that tells the story of a family separated following a mysterious and devastating event. Robert McEwan works in a central London skyscraper, and watches in amazement at the scenes of mayhem unfolding on the ground. His first thought is to reach his family. Emma McEwan and five-year-old Steven are caught up in the chaos. They rush to get home, only to find that their journey is far from over. As they struggle to survive and reunite in the brutal new world, they find that the places they once knew are no longer safe, and many of the people they encounter are utterly, catastrophically transformed. The novel runs to approximately 72000 words, and is the first episode in the End Storm Saga. The second book is scheduled for publication in early 2013. 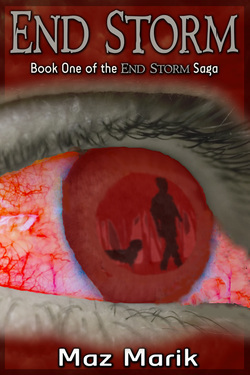 To buy End Storm from a variety of stores, please click here, or on the cover above.